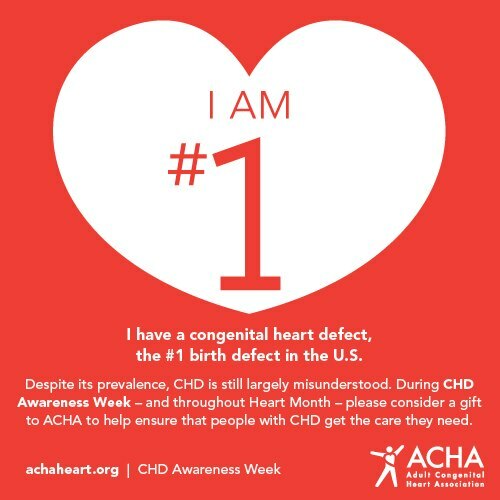 Congenital Heart Defect Awareness Week, GO! 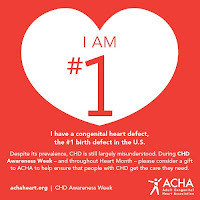 This week, February 7-14, is Congenital Heart Defect Awareness Week. There is a very good chance social media will become bombarded with many individuals and organizations posting to bring awareness to the number one birth defect in the United States. Currently, the figures for congenital heart defects are as staggering as 1 in 100 births, yet many women of childbearing age are unaware of the risk of having a baby with a defective heart. While in recent years there have been children born to those with celebrity status which has drawn some attention to this medical crisis, it is not enough. Newborn screening in EVERY state should be MANDATORY, not optional to check with pulse oximetry. While pulse ox does not catch every heart defect it does catch more than doing nothing and it does save lives, this warrants the cost of a $15 dollar test on a piece of equipment that can be reused numerous times. Ask any parent that has found out about CHD from a coroner. Newborn screening is not enough, however. We need to know how to prevent congenital heart defects and in order to do that we have to find out how they happen. Research needs to be funded. With the community that has formed in part to the accessibility from the internet, genetic links should be able to be established along with environmental and nutritional clues. We can not stop with screening, we have to press on and move further. We have to look at the future. The survivors today will have children tomorrow and those children will need answers.